Thomson Villa malayalam movie directed by debutant Abin Jacob will feature Ananya, Hemanth, Sarayu, Lena Abhilash, Innocent and Master Gouri Shankar. Scripted by Dennis Joseph, the movie revole around the mysteries associated with Thomson Villa. The movie would reach theatres in the 2nd week of May. Debutant Abin Jacob is making his directorial debut in tinsel town with 'Thomson Villa' which is expected to get released during the 2nd week of May 2013. The young brigades of malayalam film industry Ananya, Hemanth, Sarayu will be seen in the movie along with Lena Abhilash, Innocent and Master Gouri Shankar. 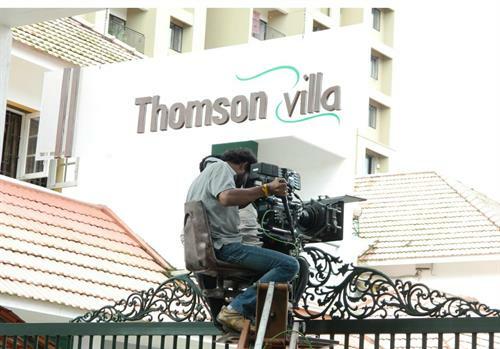 Scripted by Dennis Joseph, the movie revole around the mysteries associated with Thomson Villa. Sheelu (Ananya) is the daughter of a business magnate who has base at Kochi. Due to unexpected reasons, the business goes through the toughest time bringing down the income of the family. So Sheelu was forced to find a job to meet their daily needs. She works part time teaching music to Thomson (Gaurisankar). He is the only son of Sheela-Paul couple. Sheelu who reached Thomson Villa had gone through its secrecy. Many secrets were disclosed before her. Sheelu was fortunate to find Sevy(Hemath), her neighbor who helped her to overcome the misfortunes that followed one after another. The story takes another shape as Sevy and Sheelu put their efforts to expose the enigma related with the Villa. Six year old Gaurisankar who had given a breathtaking performance in Immanuel is ready for his second outing with Thomson Villa. Gauri do play a key role in the movie which would keep the audience intact. Young actor Hemant Menon is having a good time in the industry who is having a handful of projects in kitty. After making his debut with Fazil's Living Together, he was seen in Doctor Love, Ordinary, Chattakaari, Ayalum Njanum Thammil and Chapters. His upcoming movies include 'Perfume' directed by Johnson Esthapan. Ananya is busy with a couple of projects while her she would feature in 'Sadharanakaran' which is currently at post production.